The Frederick C. Robie House – a masterpiece of Prairie School architecture that is considered one of Frank Lloyd Wright’s finest works – reopened to the public Friday after a multimillion-dollar restoration both inside and out. Most recently, about $3 million was spent restoring the interior of the home to Wright’s original specifications and vision. That meant recreating his original autumnal color scheme, orbed light fixtures, cabinetry, and even mimicking early wall-plastering techniques and the original Magnesite ground floor material. A leaded-glass front door shattered during a student demonstration in the 1960s was also reconstructed. Perhaps most notably, the restoration returns several original pieces of Wright-designed furniture to the national landmark, including a dining room table and chairs on loan from the University of Chicago’s Smart Museum of Art. The home, now managed by the Frank Lloyd Wright Trust, was finished in 1910 for 28-year-old businessman Frederick Robie, who lived in the home for just 14 months. The trust conducts fundraising, historic preservation and tours at the home, which is owned by the University of Chicago. Starting in the early 2000s, the FLW Trust conducted more than $7 million worth of exterior renovations, including brickwork and fortifying the roof’s steel beams. With broad, sweeping horizontal lines; low, cantilevered roofs with overhanging eaves; and an open interior floor plan, the Robie House epitomizes Wright’s aim to design structures in harmony with nature – a guiding principle of his Prairie School style. 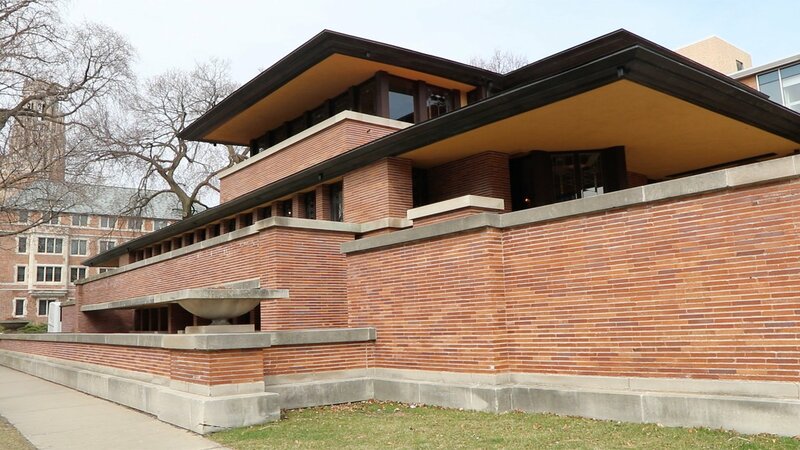 The FLW Trust conducts daily, 50-minute tours of the Robie House, located on 58th Street and Woodlawn Avenue. Tickets are $20 for adults and $17 for students, seniors or military members. For more information, visit the Robie House website. Note: This story was originally published March 29, 2019. It has been updated.